The success of an enterprise ultimately depends on creating a culture that is truly adapted to satisfying the long-term needs of its customers. Organisations with a high cultural capability comprise people who are highly engaged towards realising a clear, shared vision of success. Leadership should positively reinforce high levels of engagement, and unity of identity. A focus on boosting employee engagement may have been gaining momentum over recent years, but is perhaps nothing new as a concept. Classic research in the 1970s into job satisfaction demonstrated the importance of creating meaningful, fulfilling work that provides autonomy and personal growth for people. It is now well established that more engaged employees are more productive, persistent, proactive and adaptable. Therefore, focusing on building engagement, rather than trying to ‘manage’ performance is much more likely to facilitate greater outcomes. After all, by the time a manager conducts an ‘appraisal’ of work performance – it is too late to influence the outcome! – the business is focusing on a lag measure, rather than a lead measure. The emergence of a high-engagement organisational culture is dependent on a myriad of factors, and largely as a product of the leadership of the business. Get this right, and the culture follows. 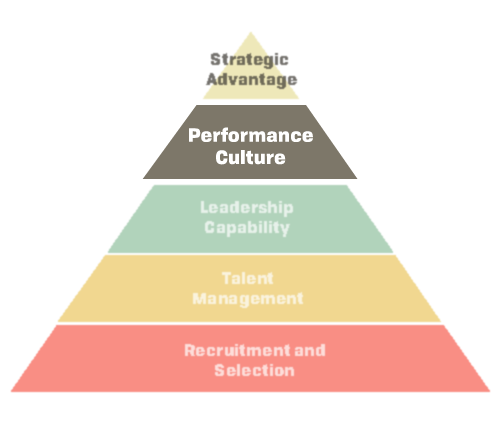 There are also practical steps you can take at the level of performance management to further strengthen a high-performance culture, e.g. such as placing the emphasis on creating strong 2-way psychological contracts with employees, focusing primarily on coaching and feedback - rather than evaluation. Performance management is a critical aspect of organisational effectiveness and the vehicle through which work tends to get accomplished. Unfortunately, traditional approaches to appraisals miss the opportunity to help people to truly engage and motivate people, and workplace appraisals typically feature poorly in employee engagement surveys.